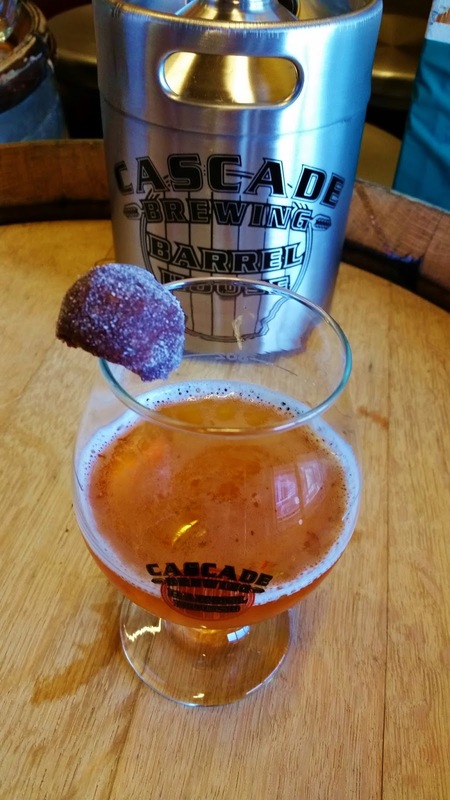 Cascade Brewing is a mecca for sour beer lovers and they're in the midst of a big expansion at the SE Barrel House. The barrels have been moved to a 23,000 square foot warehouse in SW Portland that will eventually be the headquarters for all blending, aging, packaging and distribution to allow for a larger pub and tasting room. Utilizing the full 7,100 square feet of the building will more than double the amount of interior seating, feature a 40 foot bar and give Executive Chef Troy Harris a full-production kitchen, allowing for an expanded food menu. The patio will also get an upgrade with overhead cover, heaters, integrated landscaping and expanded outdoor bar service. Take a listen as Brewmaster Ron Gansberg and Owner Art Larrance reflect on where they've been and where they're going. Tonight's Tap It Tuesday is Almond Amaretto, a blend of Sour Blond and Apricot Noyaux and of the beers I tried last night it was my favorite. If you have a sweet tooth like I do, order up their Dark Chocolate Bourbon Balls to go with it. These orbs of goodness are somewhere between molten chocolate cake and the center square in a pan of brownies. Cascade recommends pairing them with Oblique Black & White Coffee Stout or Gingersnap and while I don't dispute both would be good, they're also darn yummy with this beer. It's not a loss; it's a change. A change even more profound than moving halfway across the country to a city where we knew no one. It was just the three of us and now the two of us have to figure out how to exist without the third. I know, this doesn't sound like much of a beer-related post and no, I haven't decided to give up the most delicious beverage on the planet. This is a post for me so if you decide to stop reading now, that's ok; I promise we'll be back to regularly scheduled programming soon. Otherwise, I appreciate you hanging in there with me. Yesterday we said good-bye to our furry child, the one who had defined us for over 13 years. As I was searching for a particular picture I ran across one of our favorites of our little beer girl. 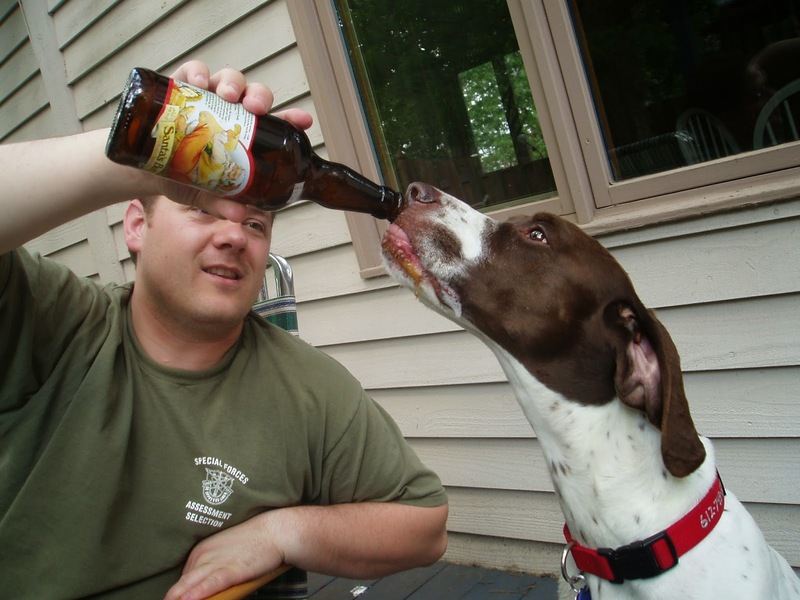 Just like you shouldn't let human children drink a full bottle of beer, we would never have given that much to our furry child. But, just like many of the parents I know, a sip, dip of the finger into the glass...well, I don't see a darn thing wrong with that. For as long as I can remember our girl was a beer girl and the hoppier the better even though those hops never failed to make her sneeze. So on the day we said good-bye I guess it's only fitting that we'd already had beer plans. They weren't just any beer plans, though; they were in fact plans that involved a movie and three IPAs. We weren't sure we were going to go, that'd we'd be ready to have a bit of fun, but as the afternoon progressed we knew it would be better to be out than at home so off we went. It wasn't an uber beer geek event but there were folks we knew there and it was a good beginning to the next stage. And the beer was good, thanks to the brewing team at Lompoc headed up by Bryan Keilty. The IPAs, The Spy Who Dry Hopped Me, Dr. Hop and From Lompoc With Love, of course are named to play off Bond movie titles. Our girl spent many hours watching Bond films with us and she would have loved to have sneezed her way through all three of the beers with us. ﻿Last night I got into, wait, I willingly pursued a bit of a row on Twitter regarding the opening of a new AB InBev revenue source in town. I tried not to be mean, simply stating that making the choice to spend whatever-amount-of-dollars there meant that those were dollars not going into the hands of craft brewers. I make choices, you make choices, they are often different and in the end we each have to acknowledge the impact of those choices. Near the end of the back and forth I conceded that there were plenty of people, in the craft beer world and beyond, that were excited about the opening. Some of them don't share my view about what the impact of choosing to support AB InBev means and some of them don't care. More importantly I realized that I the beer thing* I got excited about today was news from Brooking, OR (population 6,400-ish). In case you missed it Chetco Brewing is making plans to open a tasting room. That's a big step for a little operation. I'm not a road tripper so the six hours that separate me from Chetco will make regular visits to the taproom unlikely. That means many of the funding rewards aren't as attractive** as if I lived down the street. What is attractive is the opportunity to spend my whatever-amount-of-dollars to support a great guy who makes some darn good beer. I'll bet that Mike would agree with the comment from another craft brewer who weighed in on that back and forth saying that his brewery "is growing, tough fight though." 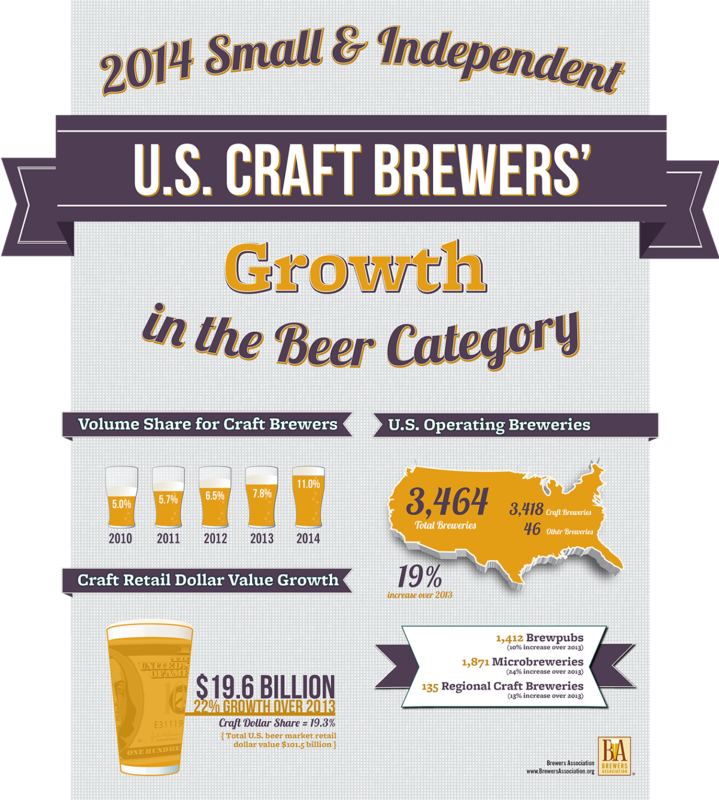 Craft brewers may have reached double-digit volume share for the first time in 2014 but it's no easy line to tow. So if you're like me and find it important to support those chipping away at the ever-decreasing market share of Big Beer, check out Chetco's funding campaign. And if you'd rather give that money to a macro, that is still your choice. *The exciting non-beer thing was the opening of Chizu. Long live cheese, one of beer's perfect pairings. **That being said I'm still pretty tempted to have my name on one of the barstools just because. I was bummed to have missed McMenamins 22nd Annual Hillsdale Brewfest this year but was able to make up for that by taking the winning brewer up on his invitation to visit. If you haven't heard, the winning beer was Cerberus Wild Ale, brewed at the Edgefield Brewery where Matt Bergfield is the Head Brewer and manager. The beer is a blend of Belgian strong golden, Berliner Weisse and golden ale that has been barrel-aged with Brett. It's a nicely tart, but not punch-you-in-the-face sour and very drinkable. As a fan of all manner of tart/sour beers I certainly would have had this on my short list if I had been at the festival and agree with Matt that this beer winning is reflective of a shift in many people's palates to less hoppy/more sessionable beers. It'd take a pretty big pair of britches to wear this belt. 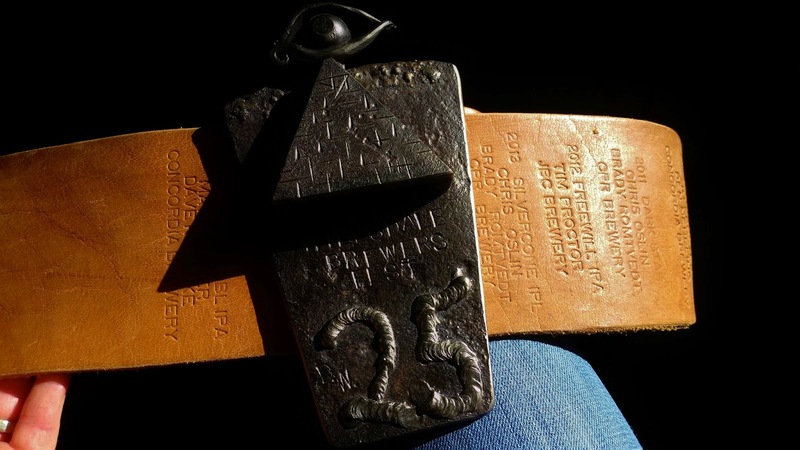 In past years the winner of The Belt, the physical prize of the festival, also had their beer showcased as the McMenamins submission to the Oregon Brewer's Festival. I've been of the mind that it's a very equitable way to select one beer out of the hundreds turned out annually from the stable of McMenamins breweries. This year McMenamins will go through a different selection process, making the decision internally instead of leaving it to a people's choice vote. At first I was disappointed but in chatting with Matt realized that it is probably a wise decision for McMenamins. OBF if not only the largest beer festival in Oregon but it draws people from all over the world, people that may never have had a McMenamins beer before and of course they want to put their best foot forward. Matt, an east coast transplant, didn't expect to take top honors at the festival and was pleasantly surprised with the win. The Belt now hangs in the brewery office alongside a machete, which legend has it former brewer Jason McAdam (of Burnside Brewing) brought in to cut his mash. Weird, yes, but legends often are. Always interested to hear brewers' back stories I asked Matt about his and found out that he and his wife came to Oregon three years ago, via a cross country bicycle ride from their former home in Boston where Matt worked at Harpoon Brewing. The ride started with dipping their tires in the Atlantic and ended with a dip into Pacific waters in Astoria, after which they made the decision to set down stakes in Portland. 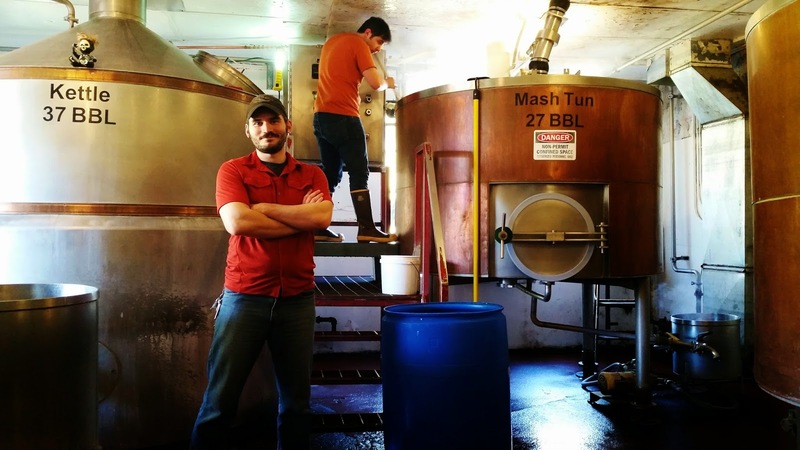 Working first for Harpoon and now McMenamins, neither small companies, Matt sees one of the biggest advantages of working for a larger company is that "all your payroll doesn't depend on each batch." I haven't directly asked some of my favorite small brewers about this but I suspect there is quite a bit of pressure in that regard. It also means that when Matt brews a beer he loves, a recent batch of mild for example, but it doesn't sell well it's simply one batch in hundreds that are turned out. Kegs waiting to be repaired, beer being barrel aged & sour magic happening. Many of us, me included, tend to give McMenamins less than a fair shake when it comes to their beer. Matt admitted that in the past, when the price caps on batches were in place, there was perhaps a different focus for the McMenamins brewers. These days, however, they have more flexibility and if you've had more than just a passing pint I think you'll agree that the quality has gone up. 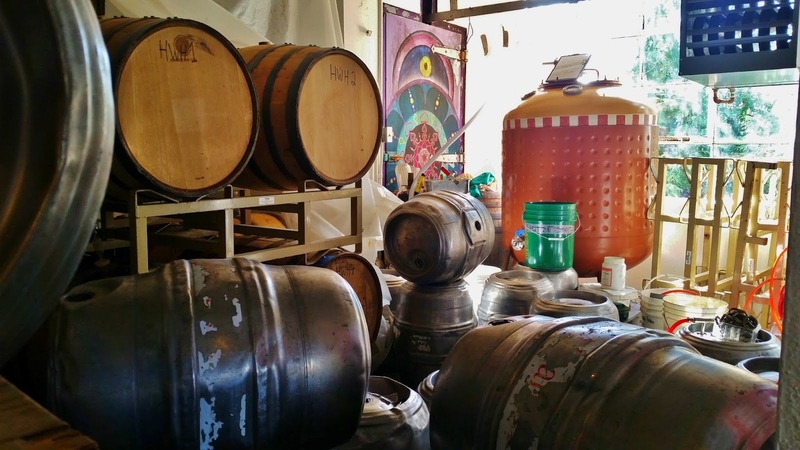 At Edgefield they're putting more beer in barrels from their winery and distillery and delving into sour beer. Thanks again to Matt for inviting me out. If I've managed to convince you to give McMenamins, and Edgefield in particular, a second glance I suggest following Matt on Twitter for updates on special releases and more.